Just a brief note to say I'm off to Chamonix in the French Alps and will be back at the end of the month. Looking forward to log fires, lovely food and wine and cosy chats, and trying to ignore the mounting hysteria as I think about ski-ing for the first time in 22 years! Wishing you all kinds of warmth. Readers tend to access poems in stages, however small and fleeting, and, at times, unconscious. 1. They notice the size and shape of the poem without reading the actual words. 2. They estimate the effort required to read it. 3. They consider the title. 4. They read the first few words, the first line. 5. They enter the whole of the poem. It's probably after 3. that a reader begins to be nudged forward in a willingness to trust the poem and the poet, or grows more suspicious. The degree that a poem is successful is the degree to which some, or all, or these elements are made important to the reader, and if we want to reward a reader, and encourage them to 'stay', then at least one must be made important as soon as possible, either in the shape on the page, or the title, or in the first line or two. Although the balance between rewarding the reader but not answering their questions too easily is sometimes difficult to find. We want to satisfy them, in some way, but also make them want more. When you post your poems in response, perhaps you could add some brief notes about how you feel you've attempted to reward the reader, the things you consciously considered. Write about the last day of your life. Write a poem that starts in one place and ends in another - physical, emotional, intellectual. This isn't something I've fully explored in my own writing, but I 'feel' it here in Linda's poem and I'm sure other readers will too. Congratulations again, Linda. 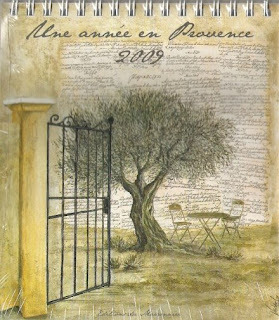 Please email me with your postal address and I'll send you your prize, this lovely Desk Calendar, 'Une Année en Provence', for 2009. Or even a poetry treat for yourself? Then I can really recommend this desk Haiku Calendar for 2009 from Snapshot Press. I can just hear the 'clatter' as a boy goes past on his bike, but that was the summer and now the season has changed. And on top of having a daily dose of poetry you'll be supporting a small publisher whose books are of outstanding quality. ...to say I'm reading the November poems and will be posting the Prize Poem soon. And, of course, please post any poems that emerge.